Pack your bags, everyone! NASA announced today it’s discovered seven new Earth-sized planets, at least three of which could potentially support life. And, they are relatively close by. 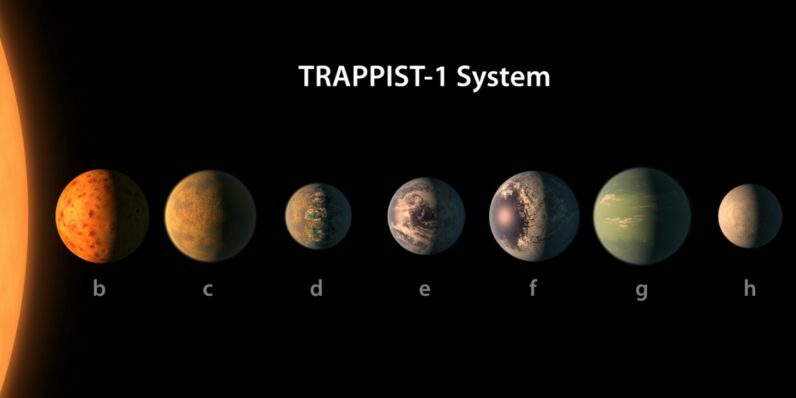 All of the planets orbit TRAPPIST-1, an ultra-cool dwarf star roughly the size of Jupiter. The system is close to Earth, relatively speaking – TRAPPIST is located in the Aquarius constellation, less than 40 light years from us. What makes these exoplanets special is they are temperate – meaning all seven could potentially have water. Three of the planets are in the habitable zone, making them the most likely candidates to support life. The TRAPPIST system is named after the telescope in Chile with which researchers originally spotted the exoplanets. Their existence was recently confirmed with NASA’s Spitzer Telescope. So far, all we know about our potential new homes is they are likely to be rocky. They are all also closer to their star than Mercury is to our Sun, but the star is so cool that the furthest of the seven is probably a ball of ice.